The beautiful beaches and cultural treasures of Tunisia made her reputation. 6 million tourists visit Tunisia each year, which is the first destination of French. The Customs access is facilitated for nationals of the European Union and the Americans who do not need a visa. Tunisia has developed tourism structure important in the 90s: nearly a thousand hotels, 7 and 9 international airports, ports support access to resorts: Djerba, Tabarka, Hammamet, Sousse, El Kantaoui, Sidi Bou Said ... From Tunisia is so easy and most importantly cheap. Trip2visit.com offers a visit to Tunisia, a country of narghile and jasmine. Tunisia contrasts with its beaches, plateaus, deserts, white villages, you will surely delight from the home by its people. The light of the country you will delight at the exit of the airport or at the landing of the boat! Apart from heat, light remained in our memories. Whether on the coast or inland, in idleness or excursion, it is a symbol of the country and will accompany you throughout your stay. 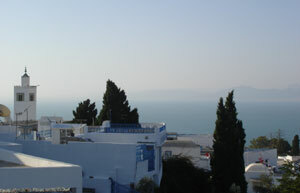 As such when visit ancient Carthage , at a excursion into the Tunisian desert , or visit Sidi Bou Said . Tunisia is the smallest country in the Maghreb area (Tunisia map here), but is none the less hospitable. Even turista is not too violent and should not be too risk disrupting your travel. While en route to visit and search of good info. As in most countries tourist trap of false or misleading guide exists in Tunisia. The situation has improved in Tunisia in recent years. We do not on we encountered this type of problem, which is a good sign. Then we go to visit Tunisia with Trip2visit.com! Add to bookmark this page Tunisia " Tunisia Home " - Firefox do "Ctrl D"